Ion Chromatography (or ion-exchange chromatography) is a chromatography process that separates ions and polar molecules based on their affinity to the ion exchanger. 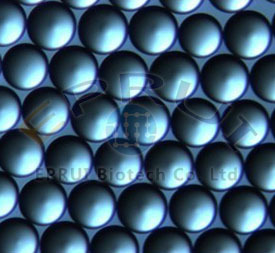 The matrix of EPRUI’s ion chromatography is highly cross linked polyacrylic microspheres with a hydrophilic coating. The most commonly used ion exchange matrix is cellulose, sepharose and polymer resin. 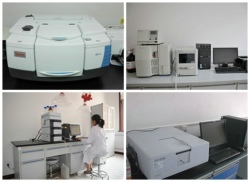 Ion exchange chromatography is often used in protein purification, water analysis, and quality control. The water-soluble and charged molecules such as proteins, amino acids, and peptides bind to moieties which are oppositely charged by forming ionic bonds to the insoluble stationary phase. The equilibrated stationary phase consists of an ionizable functional group where the targeted molecules of a mixture to be separated and quantified can bind while passing through the column. This method applies the idea of the interaction between molecules and the stationary phase which are charged oppositely to each other. Therefore, Ion exchange chromatography can be classified as cation exchange chromatography and anion exchange chromatography. Cation exchange chromatography is used when the desired molecules to separate are cations，meaning that the beads in the column contain negatively charged functional groups. Anion exchange chromatography is used to separate anions, meaning that the beads in the column contain positively charged functional groups to attract the anions. The bound molecules then can be eluted and collected using an eluant which contains anions and cations by running higher concentration of ions through the column or changing pH of the column. The matrix of EPRUI’s ion exchange chromatography is highly crosslinked polyacrylate. Compared with traditional cellulose and sepharose matrix, it has great mechanical strength and the column volume does not change when increase pressure and flow speed. Its good back pressure resistance performance highly increases the purification efficiency. EPRUI S series ion exchange chromatography is made of highly cross linked polyacrylic microspheres with a hydrophilic coating. Then, the desired ion exchange functional groups are introduced onto the hydrophilic surface. The hydrophilic coating covers the surface of the resin which make the beads completely hydrophilic. This property greatly reduces the non-specific adsorption between the stationary phase and biomolecules assuring a better yield. This type of ion exchange chromatography has a high loading capacity of proteins, which is ideal for efficient separation of biomolecules such as proteins, nucleic acids, polypeptides etc. EPRUI M series is a mixed mode ion exchange chromatography, which has the same base resin and hydrophilic coating as EPRUI S series. The co-existence of bonded ion exchange functional groups and surface hydrophobic groups leads to a mixed interaction of both ion exchange and hydrophilicity. In some cases of purification, EPRUI M series could show improved selectivity and resolution which also tolerate sample loading at high conductivity.